Lottoz—a newcomer in the industry—has made it its mission to simplify the online lottery experience by providing an exceptionally user-friendly interface that puts a big emphasis on the fun and excitement of lottery playing. The market Lottoz is entering is hard to stand out in, but it's worth giving this new brand a try, if only to see if it can shake up the industry a bit. 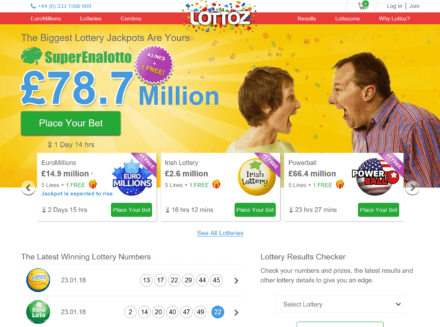 If you want a secure lottery site that offers a decent game selection but with an extra twist, Lottoz might very well suit your needs. However, being new, there are a few areas it could improve upon. Popular Lotteries: Lottoz has 16 lotteries on tap, which mostly consist of some of the most popular lotteries around—which includes Powerball, Euromillions, Mega Millions and more. Impressive Lottery Education: Lottoz provides in-depth information about each of the lottery games they offer. These include: Game mechanics, hot & cold numbers (numbers picked / not in the last 3 months), and other helpful statistics (jackpot history & trends). Choose Daily Deposit Limit: It definitely seems that Lottoz cares about their players; they make you choose a daily deposit limit in an effort to nip possible overspending in the bud. Free Lines and Ongoing Promotions: Lottoz offers free lines on some of its draws, as well as changing running promotions. Subscriptions: Players can get a subscription to any of the lotteries offered on the Lottoz site. This ensures their automatic participation in every draw. Subscriptions are monthly and can be discontinued when the customer chooses. Combos: Lottoz offers branded combos that are groupings of several lotteries (with varying numbers of lines). Each such "bundle" has a branded title to match its contents and normally offers a discount. Regulation and Security are Guaranteed: Lottoz is regulated by the UK gaming commission and employs Norton SSL so your payment data is safe and secured. More than that, they also place your tickets in safekeeping. No Other Game Types Right Now: Currently, Lottoz only offers single play lottery games—no syndicates, raffles or scratch cards—though all of these are in the works. Limited Payment Options: So far, Lottoz only accepts Visa, MasterCard and Maestro, so some players who use other modes of payment might find themselves in bit of a pickle here. English-only Website: This might be due to the fact that it is a very young brand, but Lottoz currently caters to English-speaking players alone. Lottoz—a new lottery agent service owned and operated by Morpheus Games MT of Malta—allows you to participate in a wide range of lottery games from all over the globe. Upon submitting a purchase order, Lottoz’s agents go out and buy tickets on a player’s behalf. Their UK and Ireland sites, on the other hand, allows players to bet on the outcome of official lottery games. Either way, because all their sites are licensed and regulated by the Malta Gaming Authority or UK Gambling Commission (depending which version of the site you are using)—not to mention secured by Norton SSL encryption—you can be sure of a fair and legitimate lottery experience. One of the things that Lottoz gets right is the core user experience. It shows the moment you land on their website. If you’ve played in an online lottery site before, chances are you’ll immediately feel familiar here. The design is simplistic yet eye-catching, with bright colors giving off a fun vibe, while the layout doesn’t get in the way like some sites do. Lottoz also gives you enough data without being overwhelming. Right on the home page, for instance, you can see how long until the next draw date begins for each game; as well as a timer that counts down to when tickets will no longer be available. In each game page, you can also get a glimpse of useful statistics like the previous winners; the percentage of users that use their supposed lucky numbers; hot and cold numbers; the odds of winning depending on the number of picks; and many more. On top of that, Lottoz’ website is also mobile-friendly, so you can continue placing bets while on your smartphone or tablet. You don’t have to be tethered to your desk to play. While on your daily commute, for instance, you can: choose numbers and enter into lottery draws, or even check the statistics and base your pickings from previously reoccurring numbers. Basically, every single thing that you can do on their full website can be done on-the-go, on your mobile device. The only complaint with Lottoz’s website is that you can only choose how many draws that you want to participate in during the checkout process and not before when you are choosing your numbers. The process would be much more seamless that way. Of course, other people may not have an issue with this as it is a pretty small gripe. Overall, you’re looking at a user-friendly website that anyone—whether an online lottery veteran or a newcomer—can easily enjoy. Find the “Join” link—which should be right next to the “Log In” link up top—and click on it. A registration form will pop up. Provide details like your first and last names, email, password, birthdate, country of residence, and your address. Click on the green “Create an Account” button when you are done. Deposit some funds, or you can also choose to do so right before checkout. Choose which game you want to play. Pick how many lines you want to enter. For each line, pick the numbers you want to enter. You can do so manually or you can go for the Quick Pick option. If you are done choosing numbers, click on the “Add to Cart” button. Review your purchase order. You can also specify how many draws you want to participate in here. You can also add more lines if you want. Complete your purchase by clicking on the “Proceed to Secure Checkout” button. Pray that the odds are in your favor! Right after purchasing an entry, Lottoz will show you details like what lottery you entered; the date of the next draw; your total winnings; and your current running balance. It’s advisable to save these details in case you win, but if you happen to lose the details and forget what your numbers are, Lottoz’s support team can help you retrieve that information. It’s also important to note that, when picking your numbers, you can also save them as part of your Lucky Numbers. Simply click on the heart icon after choosing the numbers to save them. Doing so will allow you to play them automatically in future games. On top of that, Lottoz offers players the option of getting a subscription to any of the lotteries they offer. You can choose to subscribe on the lottery ticket page or when you reach the cart. Lottoz has also recently launched a great feature in the form for branded combos. Each combo is a single product that automatically includes a few different lotteries (with accordance to its theme) and normally offers a discount. Pretty convenient! For most players, Lottoz’s game selection should be more than enough. However, if you’re the type of player that likes to play in more than just single play games, note that Lottoz does not have any group play games (aka syndicates). They also don’t offer raffles, instant win games, or virtual scratch cards, if you’re into those. It’s still very early into the life of the company though, so they could add more game types in the future. It’s easy to see them expanding their current line-up to attract more players. In fact, based on a section in their Terms and Conditions, they are already accepting syndicate entries in some capacity. That said, they don’t have a full system for it in place yet—which is probably why they aren’t openly advertising it. So, for now, single play games are all they have, for the most part. Still, what they offer rivals the single play offerings of some more established lottery sites—which is an impressive feat all its own. For those looking for more value out of their ticket purchase, Lottoz’s free line promo should satiate the bargain hunter in you. To qualify for a free line, you must meet the minimum number of lines. So, for example, the Euromillions lottery game requires that to get 1 free line, you must get 5 lines first. For other lotteries where this promo is applicable, the requirements may differ. Lottoz’s banking methods are, as of this writing, a bit limited. Currently, Lottoz accepts payments using Visa, MasterCard and Maestro. Withdrawal methods, meanwhile, depend on which deposit method you use. So, if you, say, used Visa to pay for the tickets, cash outs are restricted to that payment option. Speaking of cash outs, take note that you must withdraw at least €20—or its equivalent value in other currencies—for transactions to push through. Another thing to keep in mind is that you can request for withdrawals at any time, but don’t expect to get every payment immediately. Expect payments within 10 business days. Lottoz delivers lottery results in real-time via their free alerts. You can get notified via email or SMS at no cost—which makes it much easier to know if you’ve won something. Like other lottery sites, if you hit the jackpot, they will contact your personally, and give further instructions on how to claim your prize. So, if you get a call from Lottoz, that probably means you’ve won big! As for claiming prizes, it works, for the most part, exactly the same as it does on other sites. For jackpots, you may be required to claim your winnings in person. But, for smaller wins, Lottoz will transfer your winnings into your account—no need to travel anywhere! Another thing worth mentioning: Lottoz does not take a percentage from your winnings, which lets you enjoy more of your prize. On the flip side, if you do decide to convert your prize to another currency, extra charges may apply. One of the best things about Lottoz is that they dedicate an entire section of their site on responsible gaming. It is extremely easy to lose track of how much you are spending when you are having fun—which could lead you to lose way more money than you signed up for. So, it is important to always keep yourself, and your spending, in check. And thank to Lottoz, it’ll be even easier to do so. For starters, Lottoz has a daily deposit limit option to ensure that you aren’t spending more than necessary. You can choose to limit yourself to purchases up to €500, €1,000, €5,000, €25,000, or €50,000 per day. Moreover, you can contact their support team if you would like to request for higher deposit limits. Lottoz also provides tools that let you take a break from playing the lottery if you think you’re starting to get addicted. You can go on a self-imposed break for at least 24 hours or as much as 6 weeks. If you feel that you need a longer break, Lottoz also allows you to undergo a self-exclusion period for at least 6 months and as much as 5 years. Lottoz has a short but informative FAQ section where you can learn more about their site, your account, and how playing works. For any other questions or issues, you can contact their support team via phone, live chat, or email. They can also be reached via Facebook, Twitter, and LinkedIn. Meanwhile, if you enjoy reading interesting and informative articles about lottery, you can check out Lottozone, Lottoz’s very own blog. There, you’ll find appealing content features including news, winners’ stories, guides & how-tos, editorials and more. A great blog is always a bonus since it serves as an added value to the client that may have just wanted to place a bet, but ended up enjoying some pretty engaging reading materials. What's the Verdict on Lottoz? As previously mentioned, Lottoz is fairly new to the industry, which could be the reason why some features are lacking or quite limited. Still, you’re looking at an easy-to-use lottery site where you can play in 16 lotteries from around the world. For a fun, straightforward, no-frills lottery experience, this is a very good place to start. However, if you want more than just single play games—or if you are using payment methods other than Visa, MasterCard or Maestro—then it’s advisable to wait and see if the service adds more features as it matures. Still, even though some aspects are in need of polishing, Lottoz is clearly on its way to making much bigger waves in the future.